The other day Harper and I wandered into Payless to check out the girls' sandal selection. They always have cute, inexpensive shoes for kids, and with their little feet growing so fast, I hate to drop a ton of money on shoes they'll grow out of within 6 months. I can't help myself around shoes. I just had to go to the aisle where my size was located and take a peek. I found the cutest pair of sandals with a short block heel. I had been eyeing up a similar pair at Nordstrom and waiting for them to go on sale. But so far, no luck. So, I opted to save on a similar but less expensive pair at Payless. Have a little extra cash in your bank account this month? Grab the Steve Madden sandal at Nordstrom. Pinching your pennies for a rainy day? 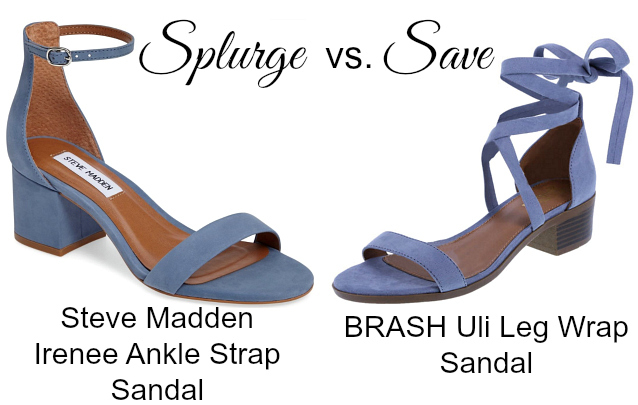 Pick up a pair of BRASH sandals at Payless. For the ultimate splurge in denim-style sandals, take a look at this pair.